T.D. Mitchell’s play “Queens for a Year” opens the Hartford Stage’s 2016-17 season with a big bang. This contemporary drama of a family of multi-generational women military personnel is a truly compelling piece of theatre which offers its audience much to ponder both during and long after the final curtain falls. Set in 2007 with its action shifting between rural Virginia and Camp Lejeune, Iraq, this play treats its universal theme of sexism in the military with candor, raw emotion, and well-delivered humor. “Queens for a Year” is the story of 2nd Lt. Molly Solinas (Vanessa R. Butler), who along with her comrade in arms PFC Amanda Lewis (Sarah Nicole Deaver) unexpectedly arrives late one night at Molly’s family home during their tour of duty in Iraq. Among this motley crew are Molly’s Aunt Lucy (Heidi Armbruster), Gunny Molly (Charlotte Maier), Molly’s gung-ho grandmother, and Grandma “Lu” (Alice Cannon), Molly’s wheelchair bound, yet still very active great grandmother. Each of these women have proudly served in the U.S. Marine Corps spanning U.S. military history from World War II to Desert Storm. With the arrival of Molly’s pacifist mother Mae (Mary Bacon), things take a turn for the worst. The show is uniformly well- performed by a top-notch cast. Standing out among these fine actors is Alice Cannon. Her feisty exclamations that “Civilians are idiots” and “the higher the hemline (of female soldiers), the higher the boys’ morale” elicit much needed laughter from the audience, diffusing many intense dramatic moments. Special mention should also be noted to Jamie Rezanour and Mat Hostetler whose portrayals of the darker side of military personnel are as chilling as the harsh military cadences they bark at their subordinate officers. The play is presented through impressionistic scenes set in the present and past. Daniel Conway’s country house kitchen is literally loomed over by a loft with piled-up sandbags suggesting the dry, middle-eastern desert. Beth Goldenberg’s simple contemporary costumes runs the gamut from down-home jeans and flannel to authentic marine uniforms to traditional Muslim dress. “Queens for a Year” sheds much light on recent military history and the personal costs exacted on women officers. 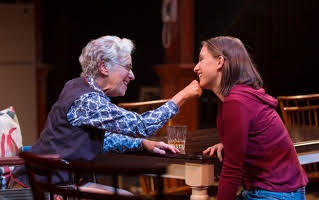 At times, particularly in the last half-hour of the show, “Queens” slips into shrill melodrama and verbosity, losing its central dramatic focus, yet overall, this new production, directed by Lucy Tiberghien, offers an evening of intelligent, solid theatre.